He wanted to put on a rock show. They wanted to learn entrepreneurial skills for the real world. Assistant professor of practice Len Neighbors decided to combine the two and have the students in his Arts Entrepreneurship class build a music festival from the ground up. 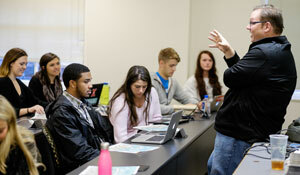 Offered as a year-long class that focuses on both communication and entrepreneurship, Len’s students have been meeting once a week since August to plan a music festival that both Wake Forest and Winston-Salem can enjoy. Under Neighbors’ guidance, students have done everything from branding the festival to promoting it to booking acts and venues. In this Q&A, Neighbors talks about the birth of DashPop and how he made the idea fit with his academic goals. Q: How did you come up for the idea for this class? A: I decided to have my students create a music festival because it is something that we could do during the course of a year. It has a discrete beginning and a discrete end. It works very well in a school year as a business. Q: What were your goals in teaching this class? A: I wanted a laboratory class to teach students about entrepreneurship, and I needed something that the students could get excited about, but also something that effectively simulated risk. Students needed to know not just what risk felt like, but also figure out if they were the kind of person who ought to own their own business. Check out WGHP’s interview with Olivia Acuna, DashPop’s head of sponsorship. Q: What previous experience do you have with the music industry? A: I helped plan a music festival in Athens, Ga., called PopFest. It took place from 2004 to 2011. It’s something I enjoy, and it’s a good contribution to the community. Musicians are also a fascinating set of business relationships. They are at the same time the best customers and the worst customers. They present the whole range of challenges. Q: How are the students working together to accomplish their goals? The students came in on the first day and were divided into teams. We talked about what each team was going to do, and then they applied to become leaders for different teams. We did some research and talked about the music industry and about Winston-Salem. I let them decide what kind of music festival they wanted to build for their community. Every student is a leader on one team and a support on another team. They are an owner and an employee. I tried to make them a leader in an area of strength and a support in an area of weakness. Every student should get to experience both giving orders and taking orders. Q: What has been the most challenging about teaching this class? A: The hardest thing has been watching the students struggle, but I want them to learn how to do this on their own and transfer those lessons to whatever they do next. Q: How do you see this class and DashPop evolving in the future? A: I love the idea of one of my students returning in 15 years to the same festival they created in the first year of teaching this class. Building that kind of tradition excites me. I hope that it catches on and that it’s taught every year, but I don’t want it to be the same thing every time. I would love if it changes to match the evolving nature of the city and the campus.